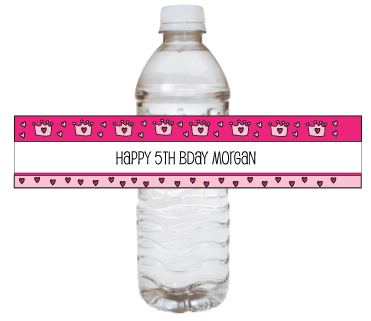 Princess Baby Shower Ideas and free princess printable decorations! Ready for some adorable pink princess baby shower ideas? There are gobs of royal ideas for this festive occasion! Princess baby showers are cute, girly and fun! Use pink tulle as a border around the cake or present table - it will look like an adorable tutu! Sweet Angel, Fairy and Princess Baby Shower Cakes! If you are planning a baby shower for a little girl - we've got some beautiful princess cakes for you to see! 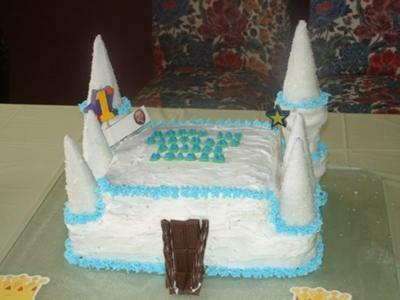 All of the cakes below have been submitted by talented readers! This was a first for me, molding an angel and a baby, but it was a lot of fun. I have never had any cake decorating lessons just some pans and tips from a yard sale. I use to watch my older sister make wedding cakes and learned what I could from her, but thought I would never like making cakes. I was wrong its great fun creating something. Hope you like it! I first made some butter cream icing in pink and covered the 12 inch cake, then I used the Chantilly lace effect with #5 tip all over the 12 inch cake. I then iced the two 8 inch cakes using juniper green and stacked them on top of the 12 inch. 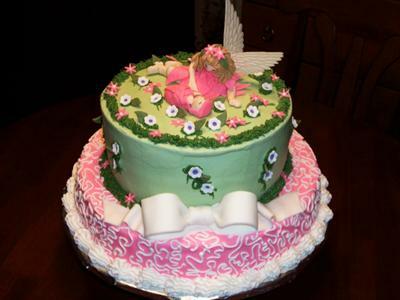 The Angel Fairy, baby, leaves and flowers were all hand molded after coloring my fondant with the different colors. Their faces were hand painted with food coloring and shiny pearl dust. I dressed them with fondant leaves for clothes. I then used a grass tip to make the grassy border on top of the cake. I finished the cake with a white large fondant bow that had been made earlier and allowed to harden. The only item that is not edible on my cake is the wings, which I purchased at a local craft store and place in her back with a pearl push pin to hold. 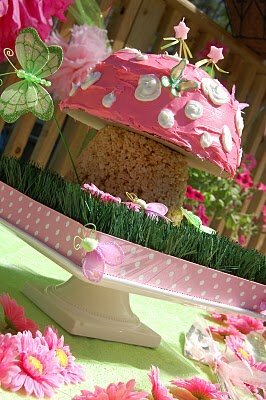 Making a mushroom cake for a fairy baby shower is a lot simpler than it looks! First you make up a batch of Rice Krispie treats and compact it into a small rounded container I used a metal pail. I placed a round PVC pipe in the middle for structural support. The top of the cake is simply a strawberry cake made in a bunt pan. Turn the cake out onto a cardboard cake round and place on top of the Rice Krispie base. Your cake is ready to ice, I dyed frosting pink and then added white polka dots, I also added some butterflies and dragonflies I got from my local craft store for an extra touch, it stood on a patch of grass to give it that extra enchanted fairy touch! This cake is perfect for showers or birthdays, and is super simple! I found inspiration for this princess baby shower cake on a website that I am a member of and fell in love with it - this was my version! This cake was so fun! First I made the tiara by attaching a pattern and waxed paper to an oatmeal container, then I piped the design on in royal icing, let that dry fro 24 hours and peeled off - that broke and I repeated the process. Baked the cakes which were french vanilla with a strawberry filling and homemade butter cream. Covered the cakes with Marshmallow fondant and then stacked. I made a pattern out of cardboard to do the impression on the top layer with the quilted look and then added the details with royal icing. I loved the boa around the cake board! 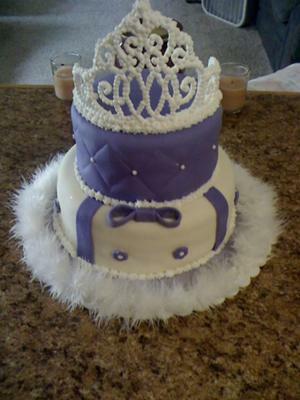 Thanks for looking at my princess baby shower cake - this is the favorite cake that I have made! 1. I started by making 2 cakes (I did Betty Crocker vanilla on top and chocolate on the bottom). You can use any 2 different size pans. I then stacked the small on top of the large. 2. The towers are 2 ice cream cones stacked on top of each other covered with almond bark and clear sprinkles. 3. Then i put icing on the cakes and decorated with icing. 4. The drawbridge is a Hershey bar with chocolate Twizzlers. This was my first cake attempt. I had a lot of fun making this princess baby shower cake! 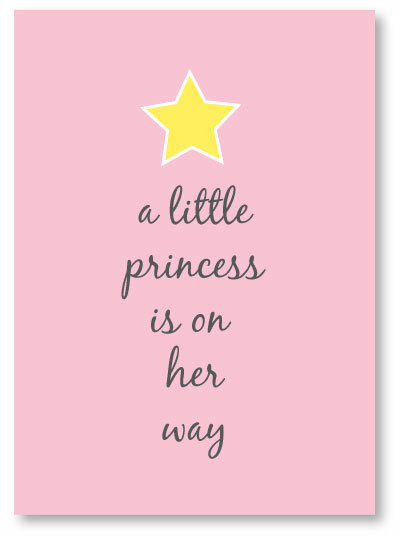 Our, "a little princess is on her way", print was designed to make your baby shower decorating a bit easier (and more affordable.) There are several uses for this fun picture. Print onto white laser paper and place into a 5x7 inch picture frame and place on the food or gift table. Another idea is to place it in an 8x10 inch frame with a white matte background and have guests sign with their well wishes it as they arrive at the baby shower. Then present the framed picture to the mom to be at the end of the baby shower for her to hang it in the baby's nursery. For a quick and easy decorating idea that also serves as a baby shower favor, fill large glass vases (found at the dollar store) with pink and white M&M's or bubble gum balls. Let guests scoop them up and put in little bags to take home as favors. Aside from princess cakes, there are so many creative possibilities when planning a princess baby shower, grab some pink flowers, feathers, tiaras, confetti and sparkles and you'll be well on your way!